The virtual city is the most ‘visible’ of the cities of the mind in a sense that the (quadralectic) essence of the latter (mind) is best represented here. 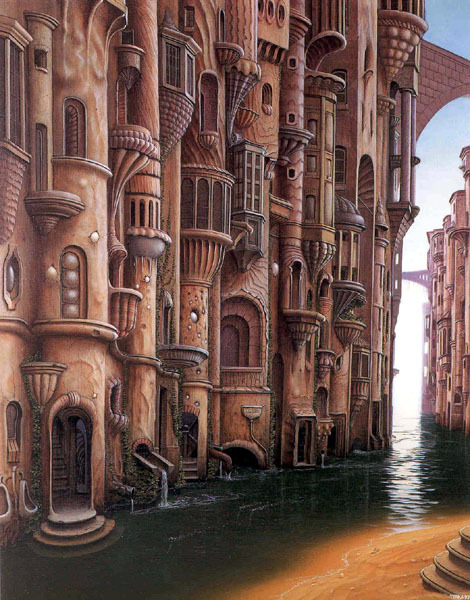 The Ideal City is a chimera in the first part of the Second Quadrant (II, 1), the Future City is an idea or a dream in the second part of the Second Quadrant (II, 2), but the Virtual City is reality – virtual reality in the third part of the Second Quadrant (II, 3). The definition of ‘Virtual Reality’ (VR) is given as ‘a technology, which allows a user to interact with a computer-simulated environment, whether that environment is a simulation of the real world or an imaginary world’. The word only figured for the first time in the Oxford English Dictionary in 1987. An informative essay on the subject of virtual architecture was written by Jun TANAKA (2004). He stated that virtual things were already completely real in themselves. The existence of virtual architecture is the existence of questions that should be answered. Spatial design can open up virtual worlds in the same way as the perceptible visible world is experienced. The origins of cyberspace might be found, according to the architect Marcos Novak (born 1957), in the abstract art of the Modernists of the early twentieth century, like the Russian painter Kazimir Malevich (1878 – 1935). These artists started to see that the invisible components of nature, like gravity, magnetism and radio waves, could be included in an objectless reality. This new kind of actualization is, in principle, completely unrelated to identity. Novak called this visible invisibility ‘liquid architecture’. By doing so, he made a link to the element water, which is designated to the Fourth Quadrant. El Lissizky (1890 – 1941) noted an ‘immaterial material’, born from light and the motion of objects. He called a search for this world a Proun (Project for the Affirmation of the New). A proun is a composition with several geometric elements, both two and three dimensional, dispersed across an uninflicted ground in a manner that defies expectations or normal (or, indeed possible) spatial relationships (Peter Nesbitt). This search for the unknown is a recognizable element in the Fourth Quadrant. The shift from the Third to the Fourth Quadrant is a process in which actualization becomes unrelated with identity and finds new expressions in multiplicity. 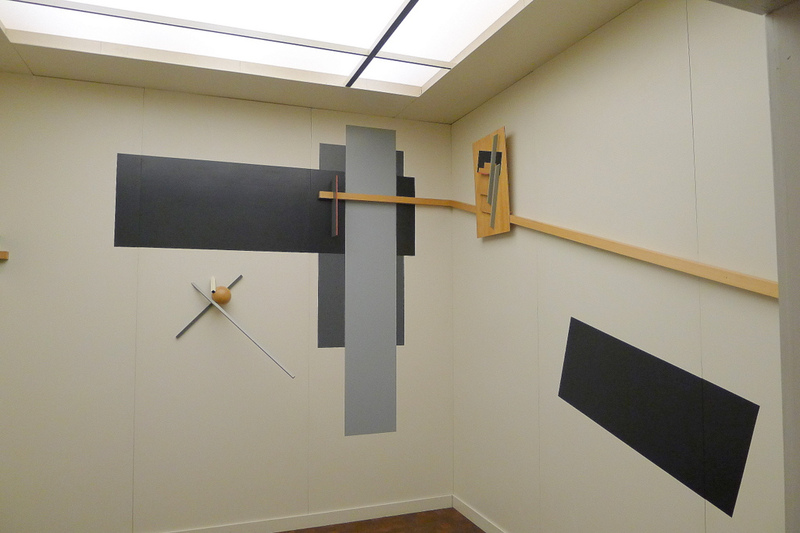 Work of El Lissizky in the van Abbe Museum in Eindhoven (Nederland). Photo: Marten Kuilman (2012). Virtual architecture is composed in changing relationships between a variety of abstract elements, like it was first experienced in Piranesi’s Le Carceri (The Prison) (see fig. 360). There is no explicit need for this type of architecture to become ‘real’, because its intention is the posing of questions and pointing to novel ways with new questions. Cyberspace is wide open for predictions of untried possibilities, either real or unreal. This character is very familiar in the Fourth Quadrant, where a virtual tool (like the CF-graph) is used to create a specific point of vision – which is in its expressions just as real as a conventional, lower division or ‘scientific’ approach, which is often started in the Third Quadrant. The first pioneer in a virtual city was probably the English poet, painter and print maker William Blake (1757 – 1827) with his plan of Golgonooza (fig. 689). Blake lived at the turning point of the Third and Fourth Quadrant of the European cultural history (1800). He can be classified as a ‘Romantic’ poet in a classic sense, but might also be seen as a visionary towards genuine tetradic thinking – without knowing which way to go. There is a suspicion that Blake was aware of a wider frame of mind, but was unable to organize its contents in a proper way. Fig. 689 – This map of the virtual city of Golgonooza was given by S. Foster Damon in ‘A Blake Dictionary’ (1965). The studies dealing with Blake’s spiritual heritage have grown over the years and are still expanding. His hotchpotch of symbolic terms and notions leaves enough material to keep students going for decades. A helpful introduction to Blake’s work was written by Kathleen RAINE (1991), who pointed to Blake’s view of the city as a living spiritual entity, with a four-fold character and composed of a multitude of lives. Blake criticized Swedenborg’s opinion – as expressed in his book ‘The Last Judgement and Babylon Destroyed’ (London, 1758/1946) – for his dualistic outlook of two cities, one for the saved and one for the damned. Blake’s city of imagination, visualized as the interior city of London, was given the name Golgonooza. The cryptic word is derived from a combination of Golgotha (skull)-Ooze (mud)-Nous-noose. In the center of the imaginary city is the Palace of Los (Los’s Forge), the time-spirit or creative energy. ——————— In immense labours and sorrows, ever building, ever falling. Blake’s tetradic visions came most clearly to the surface in his long ‘epic’ poem called ‘Vala or The Four Zoas’. It was written between approximately 1795 and 1804, but never really finished. The story records the history of the world, divided in nine Nights. The Four Living Creatures, as figuring in the Vision of the Prophet Ezekiel (or Zoas, meaning in Greek ‘living one’) acted in Blake’s interpretation as typifications of certain stages of awareness. Several scholars, like Northrop FRYE (1947/1969) and Alicia OSTRIKER (1977) gave charts of the ‘Zoas’ and their properties (fig. 690). Fig. 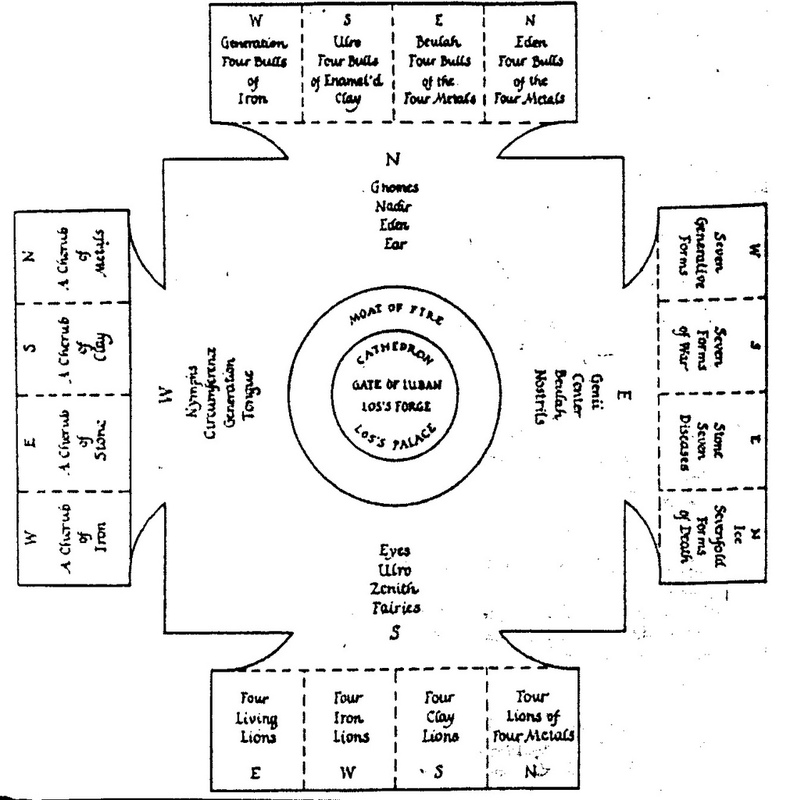 690 – A chart of the Zoas and a selection of their properties as given by Northrop FRYE (1947/1969). The seasons, times of the day and the ages suggest a temporal sequence, which would allow a comparison with the four divisions in a quadralectic communication. To associate certain properties (of the ‘Zoas’) with quadrants is an arbitrary act as long as the actual character and mechanism of a division in a communication are not understood. 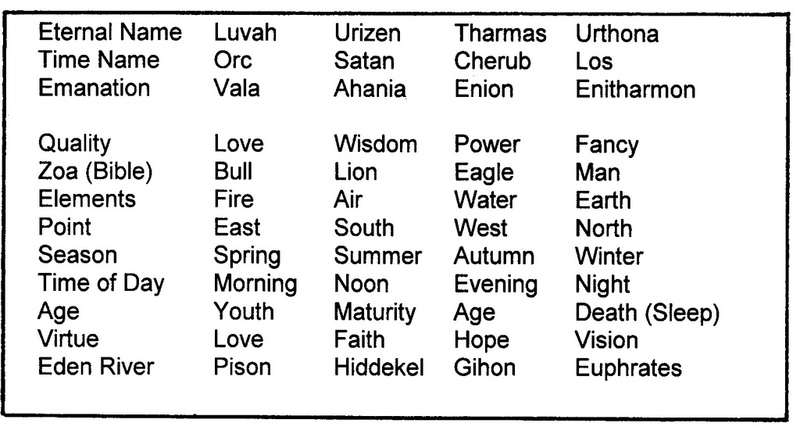 Blake’s eternal names – Luvah, Urizen, Tharmas, Urthona – are, in his spiritual world, connected with faculties of the human being – like reason, passion, sensation and instinct – but these choices do not seem to be relate to some point of measurement. The change of names and properties after the ‘Fall’ – a typical Biblical event with a distinct dualistic nature – complicates matters further. The character of a (quadralectic) quadrant is, on the other hand, related to forms of measurable visibility (presence) within a cyclic communication. Their property is a reflection (approximation) of a collection of CF-values – which gives the ‘distance’ between the observer and the observed – over a part of the total communication cycle (V). The assignment of other properties (like the elements) to the quadrants has to be guided by their degree of ‘commensurability’, i.e. by their best ‘fit’ into the approximation of CF-values in that particular quadrant. For instance, the ‘sequence’ of the elements in a quadralectic setting would be: fire – air – earth – water, since their properties correspond best with the typification of the quadrants as areas of invisible invisibility (I), invisible visibility (II), visible visibility (III) and visible invisibility (IV). It is clear, from a quadralectic point of view, that the assignment of planets (Mars – Mercury – Venus – Earth) or cities (London – Verulam – York – Edinburgh), body parts and Biblical metals to the characterization of the divisions (not given in fig. 690) stretches the limits of common sense to the limit. Blake’s classification of these entities has nothing to do with a serious awareness of a real four-fold world. He followed, more likely, the general trend of the late eighteenth/early nineteenth century to embrace the four-fold as a fashionable scheme, applicable to everything. Blake’s ‘Fourfold Man’ in his poem ‘Jerusalem’ – composed from 1804 onwards – is a vision of ‘Past, Present and Future existing all at once’. This recognition – or Point of Recognition (POR) in quadralectic terms – is an important marker point in the cultural history of Europe-as-a-whole. Another, more recent, example of a virtual city can be found in the world of the Internet. It is known as Second Life (SL) and was developed as a three-dimensional world in cyberspace by Linden Research Inc. in June 2003. It had links with video game technology, but the virtual world of Second Life is not (only) a game, but represents a fantasy world in all its aspects. Philip Rosedal started Linden Lab in 1999 after he had worked on virtual simulations during his study. The resident-users can interact with each other by so-called avatars. Avatars are virtual objects in the form of three-dimensional models or two-dimensional icons (pictures), which represent the user. Travel through the virtual world, known as grid, is also possible. The internal currency of the in-world is the Linden Dollar, for which virtual goods can be bought and sold. Some fifteen million users were registered in 2008. The island group of the Maldives opened the first embassy in Second Life. The participants of Second Life built their own virtual property, creating a dream of places with new opportunities (fig. 691). The outcome offers some promising results, but it might be too early to judge. The activity of many avatars is geared towards their own search for identity. One executive of the Second Life described its users even as losers and as people, who are unable to function in real life, but this opinion is debatable. Fig. 691 – The Temple of Bacchus – Architecture in the cyberspace. www.angelfire.com/nt/bacchai. The cyberspace of Second Life provides a playground of virtual architecture, opening endless creative possibilities. The term cyberspace was introduced by the novelist William Gibson in his book ‘Neuromancer’ (Ed. Grafton) in 1984. ‘Architecture in the cyberspace’ is now a broad subject, which deserves special attention. ‘The reciprocal spatial contamination’ between the physical space (architecture) and the virtual space (cyberspace with virtual architecture) has only just begun’. Urban space and its perception have changed fundamentally since the introduction of powerful information and communication technologies (PORADA, 1997). The discovery of a virtual ‘genius loci’ (latin: genius = guardian spirit, loci = genitive singular of locus = location) – or Spirit of the Place – has created immense possibilities, which are only recently realized.